It's an old cliché that content is king, but all clichés are based on truth. Over the past few years, the increase in content has been exponential, and in turn, this has created growth in consumption, with the average internet user now spending well over six hours per day online, most of it engaged with content. As part of our POPSUGAR Future of Retail Experiences study, we wanted to dive into the world of content and explore what millennial women believe are the most effective ways that brands can communicate and enhance their shopping experiences. Everyone likes to save money, and according to research from CreditCards.com, over 60% of American consumers are using coupons when they shop. Our study found that 61% of millennial women (and an equal amount of women between the ages of 18 and 49) said that the number one way that brands can enhance their shopping experience is to offer coupons. 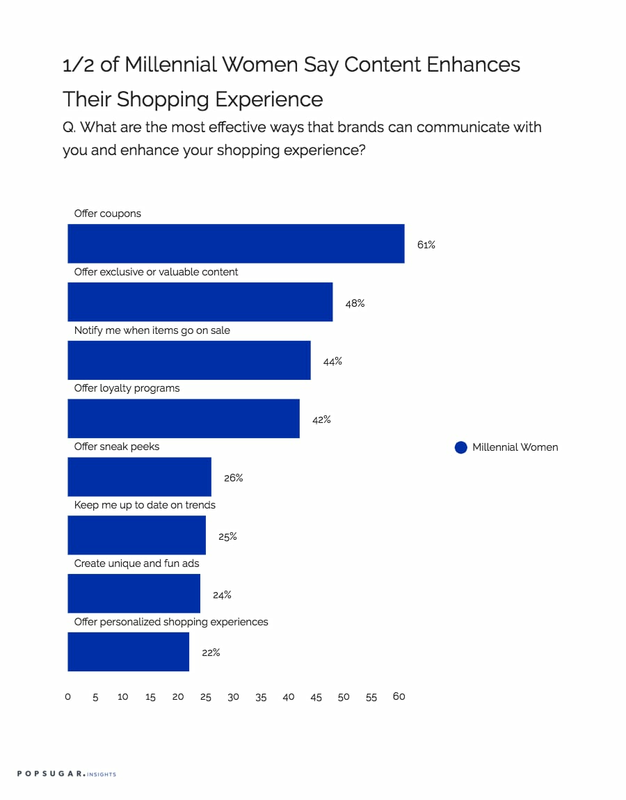 Content is a popular way for brands to help enhance a millennial woman's shopping experience. Regardless of if it's branded content or content offered in-store to enhance the shopping experience, 48% of millennial women said that brands should offer exclusive (31%) or valuable (17%) content. Millennial women are 17% more likely to feel that content enhances the shopping experience than women between the ages of 18 and 49. From a practical perspective, knowing when to shop is almost as important as knowing what to shop for, and that's why 44% of millennial women say the way that brands can effectively communicate with them is to notify them when items are going on sale. Similarly, brands that offer loyalty programs (42%) or sneak peeks (26%) of exclusive items or brands are popular among millennial women. Millennials are also very comfortable with the relationship between content and brands, and 24% say that brands should create unique and fun ads to help communicate their message and enhance shopping experiences. Over one in four millennial women say that offering a personalized shopping experience is beneficial.